One of the joys of preaching every week is the constant reading of commentaries. In preaching a message from each chapter of Hebrews for the new year, I determined to read English’s entire text on this great New Testament book. E. Schuyler English (1900-1981) was chairman of the Committee of Revision for the New Scofield Reference Bible, succeeded A.C. Gaebelein as editor of Our Hope magazine, was biographer for R.G. Lee and H.A. Ironside, and writer of various New Testament commentaries. He is also well known for his book Re-Thinking The Rapture, in which he revived the view that the “falling away” (apostasia) of 2 Thes. 2:3 is the rapture. I have always found his writings thorough and orthodox. 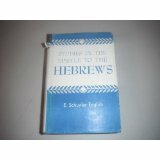 This commentary on Hebrews was a joy to read and very profitable for Bible study and preaching.